Microsoft is giving photographers a few more reasons to store their images on SkyDrive, with a heaping helping of new options for viewing and managing photos on the Web. 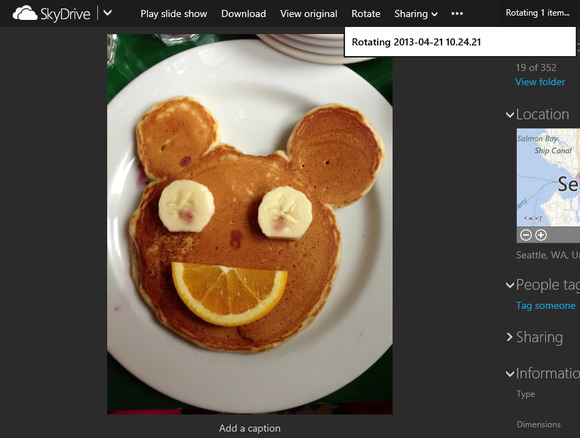 The meatiest improvements on SkyDrive.com are related to sharing photos and files. Previously, you could only share an entire folder or individual files. 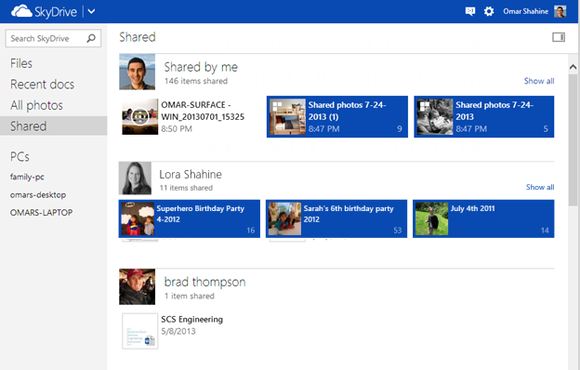 Now, SkyDrive.com lets you share multiple files at a time from anywhere in your cloud storage. You can share an entire day's worth of photos just by clicking on the date heading. The recipient will see the photos you've shared as a single album. Microsoft is also giving a much-needed makeover to the “Shared” folder on SkyDrive.com: It now shows the files you've shared, not just the ones shared with you. That should make it a lot easier to figure out what you've shared in the past and control who has access to your files. Other changes are minor, but still helpful. Animated GIF files will actually animate now when viewed through SkyDrive.com, and you can now rotate photos directly through the Website, which should help with camera photos that don't come out facing the right way. Also, the “All photos” view in SkyDrive has been expanded, so you can seek out photos in individual folders, not just the entire drive. For computers with ultra-high resolutions, such as the MacBook Pro with Retina Display and its new wave of Windows rivals, SkyDrive.com will show higher-resolution images to match. 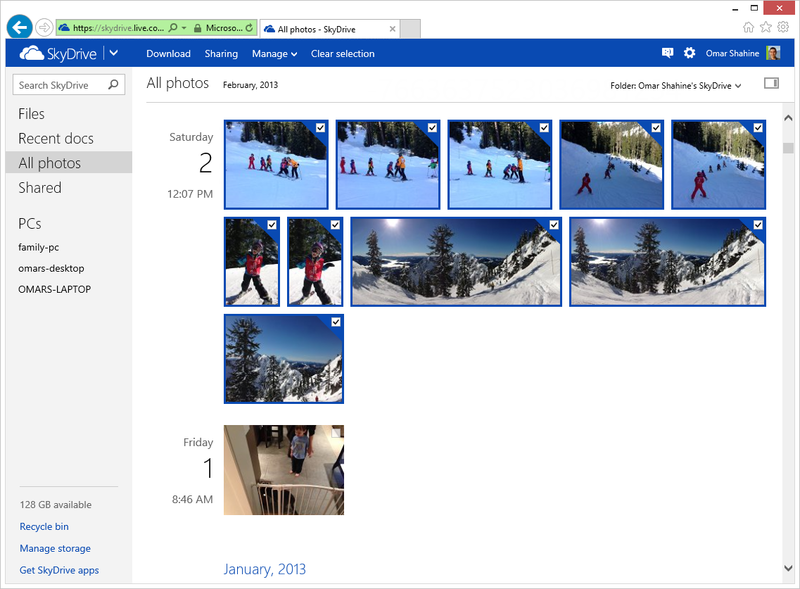 Not all the improvements to SkyDrive.com are photo-related. In February, Microsoft starting letting people edit online documents without logging in, but only if the file was shared through Office Web Apps or Office 2013. Now, users can e-mail a document through SkyDrive.com and check a box that lets recipients edit the document without signing in. Although none of these features are game-changers, they do help Microsoft's cloud storage service stand out from competitors such as Google Drive and Dropbox, neither of which offer the quick editing or date-based photo sharing that SkyDrive.com now offers. And while Dropbox does have an all photos view, SkyDrive's ability to filter those photos by folder makes this feature even more useful. 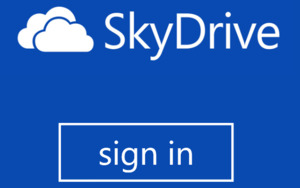 Microsoft says the new SkyDrive.com features will be available for all users today.